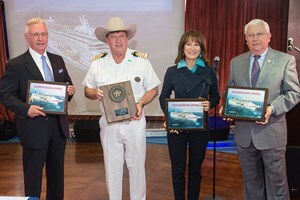 Houston Port Authority Commissioner Clyde Fitzgerald joins Norwegian Jewel Captain Kenneth Harstrom, Port Commission Chairman Janiece Longoria and Port Commissioner John Kennedy for a traditional plaque exchange upon the ship’s arrival in Houston on Saturday. Norwegian Cruise Line returned to Houston Saturday, Oct.11, when its Norwegian Jewel arrived at the Bayport Cruise Terminal between Seabrook and Pasadena. This inaugural call marked the beginning of the 2014 Fall Cruise Season for the Port of Houston Authority, as it celebrates the centennial year of the Houston Ship Channel. During a ceremony onboard, Norwegian Jewel’s Captain Kenneth Harstrom tipped his new cowboy hat to the great state of Texas, as he welcomed officials from the Port Commission, including Chairman Janiece Longoria and Port Commissioners Clyde Fitzgerald and John Kennedy. “We are excited about the impact Norwegian Jewel will bring to the city of Pasadena and the greater Houston region. According to an independent research firm, just one sailing season will create nearly 100 jobs and $50 million economic impact locally,” Longoria said. In the Bayport Cruise Terminal’s first full season of operation, the original number of parking spaces has been more than doubled, from 800 to more than 1,700, to accommodate the growing number of passengers. The state-of-the-art terminal, which combines modern design with passenger accessibility, is a short drive from downtown Houston with proximity to fine restaurants and hotels. The 2,376-passenger Norwegian Jewel features Norwegian’s signature Freestyle Cruising with 16 dining options; 13 bars and lounges; exclusive Nickelodeon programming and activities; and the largest suites at sea, the almost 5,000-square-foot Garden Villas. The vessel began sailing the first of 27 Western Caribbean cruises, which will continue through April 11, 2015. On her inaugural voyage from Houston, Norwegian Jewel will also be the first large cruise ship to call in the Western Caribbean’s newest cruise port of Banana Coast, the deep-water Bay of Trujillo, Honduras. Other port calls include Cozumel, Mexico; and Belize City, Belize. At the Norwegian Jewel’s evening departure, the Port of Houston Authority’s new fireboat gave it a dramatic sendoff with a water spray. Princess Cruises returns to sail for its second season from Bayport Cruise Terminal on Tuesday, Nov. 11, for a five-day cruise and then returns to Houston on Sunday, Nov. 16, to begin its seven-day cruises for a total of 24 sailings.